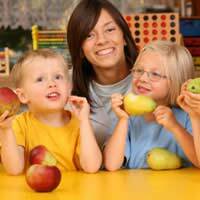 Here are our Top Ten Tips for teaching healthy eating. First on the list and the most valuable advice we can give you is to set a good example to your children. If they see you enjoying a healthy salad and fresh fruit, they’ll want to try it; if they see you leaving your dinner so you can tuck into a huge dish of chocolate pudding and cream, they’ll be justified in doing the same! That doesn’t mean that you should never have sweet puddings but try and avoid giving them a big build-up – ‘eat your dinner and we’ll have a treat’ – if you want your kids to regard them as just another food option. Don’t Use Sweet Food as Treats! This follows on from #1. We all know that, sometimes, kids need to be bribed! But a bribe can be healthy as well as tasty. Offer a handful of dried fruits or fresh strawberries or grapes. Do encourage your child to try a variety of foods from an early age. The sooner your child gets accustomed to different tastes the better and a willingness to try different options will stand him in good stead as they grow, first when they goes to friends’ houses for tea and then later as an adult. Although you need to keep an eye on the salt content of savoury foods, herbs and then spices can be introduced to children’s diets from an early age. When your child starts school and wants a packed lunch, you can make the food as interesting and healthy as you like but you still might find them coming home with an uneaten apple or with a chocolate bar wrapper – when you didn’t give them a chocolate bar! – in their lunchbox. Don’t be surprised and don’t make a fuss. Released from the regulation of eating in your sight, they’ll start to make their own choices and that may involve swapping their carrot sticks for a chocolate bar! All you can do is your best! Use wholemeal bread and pasta, fresh fruit and vegetables, fish and lean meat. You can’t force your child to prefer the healthy option but you can provide them with it! Government guidelines suggest that we should all eat at least five portions of fruit and vegetables a day. Your job is to make sure your children have the opportunity to enjoy that and more. Don’t forget that fruit juice can count as one portion. And talking of fruit juice brings us to drinks. A healthy adult is encouraged to drink 6-8 glasses of water a day (1.2 litres); start that habit early on by offering your toddler water (but not ice-cold!). Remember that fruit juices are high in sugar so water them down for toddlers and young children. Choose squashes with a high fruit content, and limit fizzy drinks by not buying them! Try, if at all possible, to sit down to eat at least one meal together in the day. Eat slowly, and encourage conversation and appreciation of the food. Take the opportunity, if it arises, of talking about organic and fair-trade produce. Let your children suggest meals; take them shopping; let them help prepare dinner; talk about why you’d prefer them to have an apple instead of candy-floss. Teach them by involving them. You can’t make their decisions for them but you can give them the best start in life with opportunity to taste and knowledge to decide. Food as well as being vital to our development and health should be a pleasure to eat. Meals with family and friends provide a wonderful opportunity for learning social skills. Healthy eating is about so much more than choosing apple instead of candy-floss!